"A Little Thanks" goes a long way! For this round card I used our 4 1/2" Colonial White Circle Cards (Z1352). I used the Simple Secure pattern from Wishes. The pink band with zig-zag stitching is cut from the ribbon paper in Cherry O (so the stitching isn't actual stitching!). The ACTUAL stitching is around the border of the card. I used Chocolate embroidery floss to stitch around the edge. It was easy and only took a few minutes. "Gratitude" is stamped in Chocolate ink. Accents are colonial white and chocolate buttons with a Chocolate Ribbon (it's real). My next card is Winning Combination from Originals. I used several stamps in chocolate ink to random stamp on the chocolate cardstock base. To make the center sentiment pop, I used foam tape. After tying a knot onto a piece of twill ribbon I wrapped it around the front of the card. Hanging from the ribbon is metal tag from the Mini Medley Accent Collection - Colonial White (Z1276). I love this collection. It includes tags, buttons, brads and ribbon. 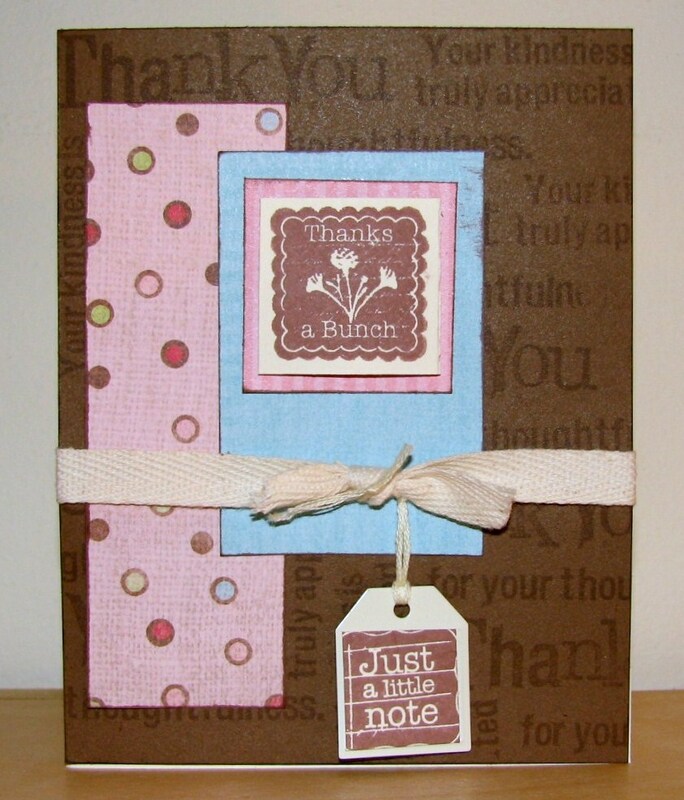 I added another stamp "Just a little note" to the front of the tag. This card was one of my favorites! I used the pattern All Squared Up from Wishes. My cardstock base front is Tulip. 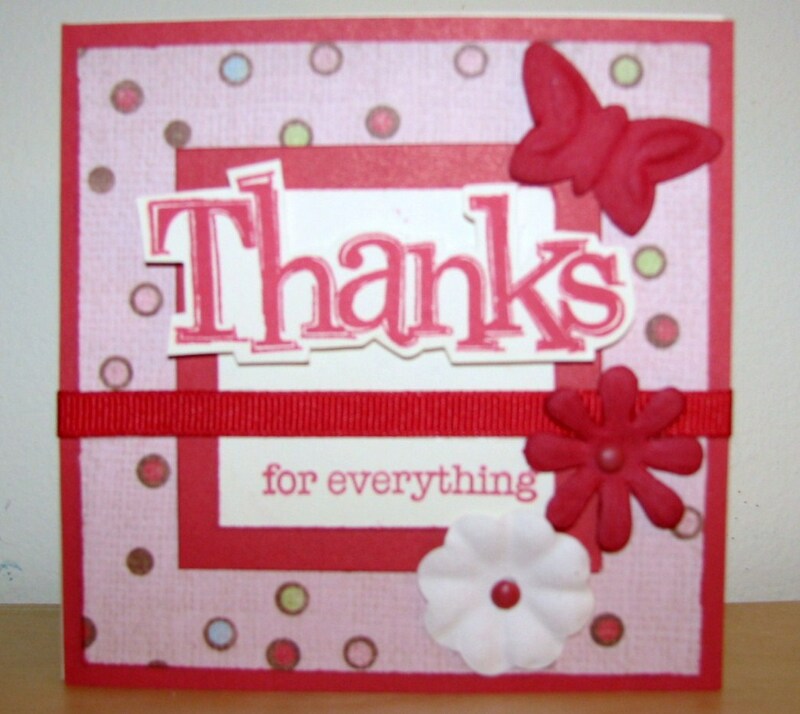 I stamped "Thanks" with Tulip Ink onto a piece of Colonial White Cardstock and trimmed it. After tying a piece of Tulip ribbon around the front, I added a couple of flowers and a butterfly from the Just Blooms Spring Blossom Paper Flowers (Z1266). The ribbon and brads are from the Mini Medley Accents Tulip Collection (Z1320) which also includes Buttons and photo clips. My last card is really just a pattern made of up scraps. 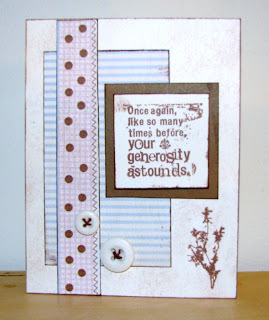 I liked the polka dot ribbon piece from the Ribbon B&T paper and wanted to use it on a card. So, I chose Colonial White as my card base. I stippled chocolate ink all over the card to add texture. I edged all my B&T paper and cardstock in the chocolate ink. The sweet sentiment is my focal point of the card. 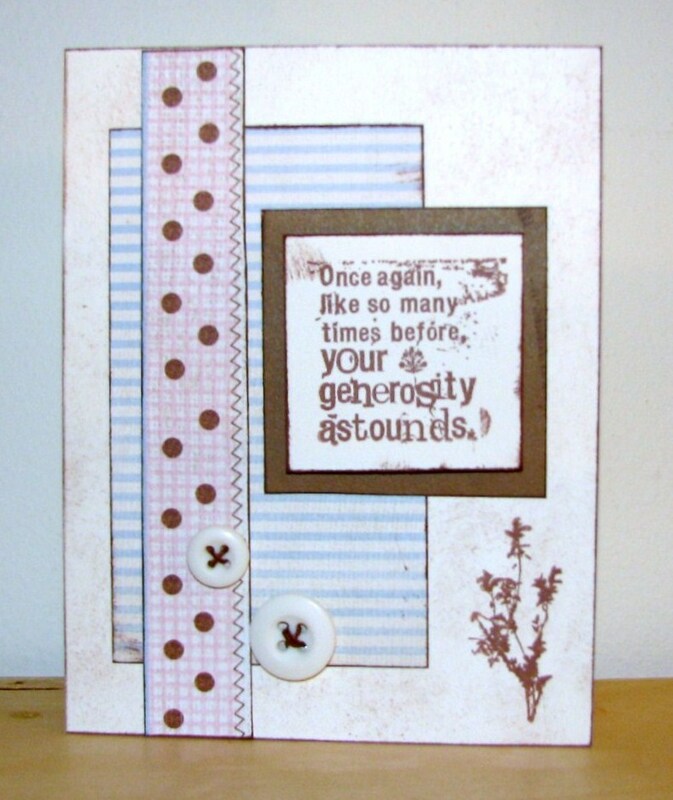 I accented the card with a couple of Colonial White buttons and a 'bunch of flowers' from the stamp set. Captured Moments - Happy Birthday Daddy! Today is my dad's birthday. I once read that a father is neither an anchor to hold us back, nor a sail to take us where we want to go, but he is a guiding light whose love shows us the way. That is my dad. He shares with us his wisdom to help us achieve the goals that we have set for ourselves. My dad has great patience, which probably grew over the years from raising four daughters. How else could one come to this point in his life with any sanity left?! Sunday evening we went to celebrate my dad's birthday so I spent some time beforehand making him a special card. One of the stamp sets I used was Captured Moments (C1423). This was the perfect stamp because as I made my card for my dad, I thought about the 'captured moments' that we spent together over the years as I was growing up, then married and began raising children of my own. I used several techniques on this card. The blowing tree at the bottom of the card is from the stamp set Captured Moments. I inked the stamp in Versamark (Z891) ink and then applied Clear Detail Embossing Powder (Z821). After I heat set the embossing powder, I sponged Bamboo ink over the image. To add more color, I also sponged Barn Red and then Sunset blending them into each other. I then used the brush and re-inker technique around the edges of the card. I used paper from Olivia Level 2 paper for my accent pieces. I covered one of the white chipboard pages from the Mix and Mingle album with the Sunset B&T paper. (This chipboard page was left over from a previous project that I had done. See Let's Mix and Mingle). The verse on the front of the card is from The Present (D1436). 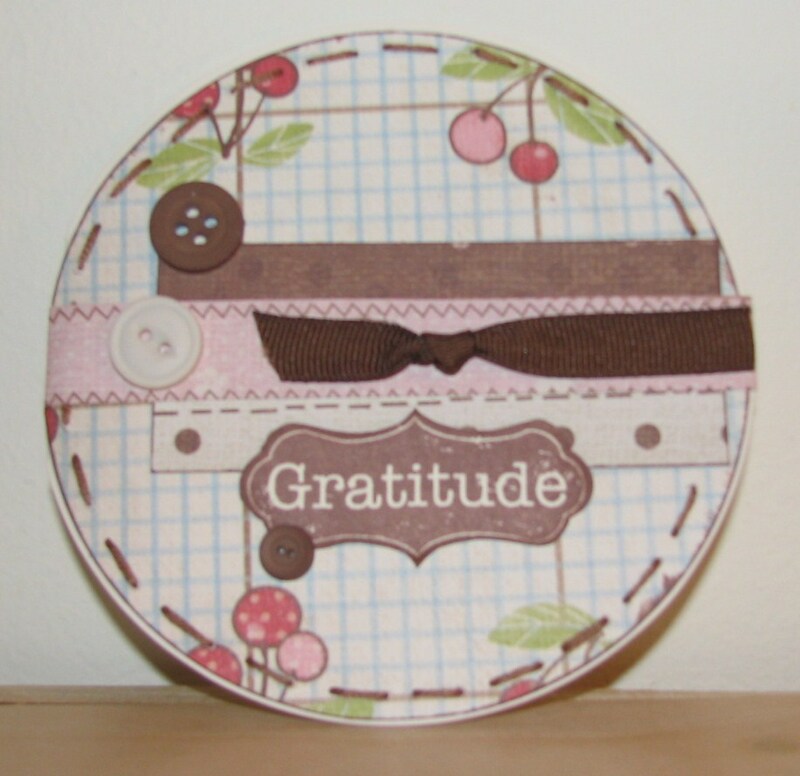 The pattern for this card was adapted from Wishes - Cuddle Collage. So back to routine.... Next week is my Hooligans Workshop! This is the cutest Halloween layout! These adorable monsters are stamped with the Troublemaker stamp that is included in the Hooligans Workshop on The Go Kit (G1012). This kit also comes with the Sunset Mini Medley Accent Collection and the instructions to complete this layout! To add some pizazz to the layout, we applied Bonding Memories Glue to the monsters and then covered it with Prisma Glitter. So now the scary little monsters shimmer! I still have lots of paper left in my kit so here is one other non Halloween Layout that I completed. This layout is from Magic: Levitate. I used the prisma glitter on the edges of the round circle and also around the edges of the Happy to be Me journaling mat. This layout shows that everything doesn't always have to be about halloween with this paper and stamp! If you get the kit, don't forget to make the cards! They are so cute! Who knew back in July when I won this fabulous trip it would make a lasting impression on my life. I did not know then that I would come away from this trip with 10 very special friends who will always hold a special place in my heart. I am still amazed at the bonding that took place over just a few days. 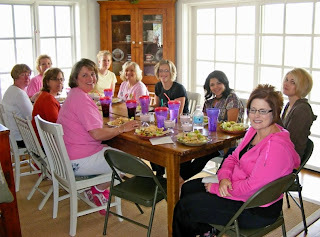 We laughed, we talked, we discussed our business, we listened to new ideas and of course we ate.- alot! I learned so much about Close To My Heart - the company and the people there. Kristine explained why and how they come to many of the business decisions they make. I am SO PROUD to be a part of this great company. This is a company that truly does care about their consultants. Kristine and Monica are such warm, fun, SMART and BEAUTIFUL ladies. It means so much me (and all of us) that they took precious time away from their families to spend it with 9 ladies that did not know. They took us in and treated us like family. It really was special. 1. Lori really can put her WHOLE fist in her mouth! 2. Don't try to put your album together if you've stayed up past your bedtime. 4. Jamie, Jamie, Jamie - Eventually that will be the right answer! 5. "She could barely get her toe' in the car. I don't know why she had it. She didn't need that big toe' anyway!" 7. "As long as they aren't buying cigarettes, they can spend what they want on scrapbooking"
9. "You REALLY wear those? REALLY?" 10. "Was you at the pool Lady?" We laughed til our faces hurt and tears ran down our cheeks. That is the BEST fun ever when you can laugh like that. I'll never forget it. To all my fellow scrappin' spa princesses - I love you! Each button was sewn on by hand. The butterflies were stitched onto the layout. They also used the re-inker and brush technique on the edges. This was a technique that I had requested in answer to the survey question "What technique would you like to learn?" A close up of the Dimensional Elements "life". These were covered in paper and then they used the same edging technique as they did on the rest of the layout. THANK YOU Close To My Heart for putting this retreat together. It was an experience I'll never forget! We have now reached Saturday, our final full day of the Scrapbooking Spa Getaway. We have a full day ahead us of trying to get all of our layouts finished before packing up. Someone asked if we were given a full list of everything we needed to bring to complete our pages. I guess I should have mentioned something VERY important in the beginning. Kristine informed us before we came out to Utah that we did not have to bring a single thing for scrapbooking. No scissors, paper trimmer, adhesive - NOTHING! They provided everything we needed. Wow Imagine that! - going to a weekend crop and you don't have to pack a rolling tote, a shoulder tote and a carrying tote! (Yes I pack all of that!). Everything was provided. Our Supplies - the bag on the right was our keep. LOTS of STUFF! This layout, titled Harmony, is one of my favorites. 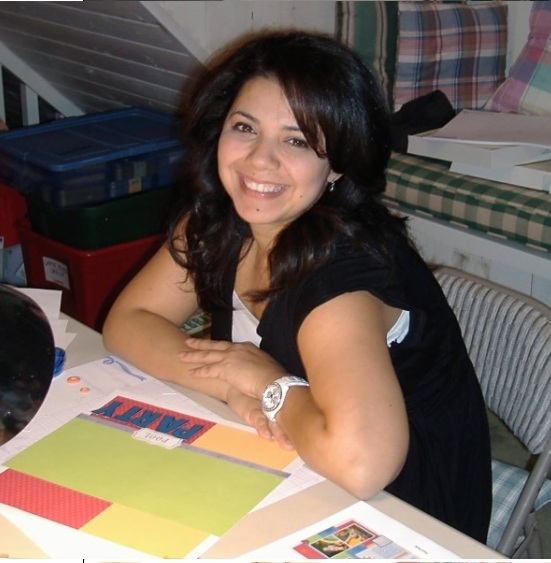 It demonstrates what you can do using only cardstock. The cardstock colors used are Bamboo, Chocolate, Sunset and Buttercup. This layout design also happens to be one of my favorites. It is "Hocus Pocus" from Jeanette Lynton's How To Book - Magic. We used 2 techniques - Dry Embossing and Leathering Technique. The dry embossing can be seen on the Sunset cardstock. After using the embossing stylus, we sanded the cardstock so that a white line can be seen on the edges. The Leathering technique is used on the Bamboo base pages. Just take an ink pad and lay it face down on your cardstock and move it around the paper until it is covered with the ink. Pretty cool! Oh! and see that peacock stamped on the right page? That is from the Circle of Love (D1438) stamp that I mentioned yesterday is currently our best selling stamp. To embellish the pages we used Foundry Flourishes (Z1331), Mocha Opaque Gems (Z1333) and Mini Medley Sunset Collection (Z1338). The flower and the butterfly are from our Irresistables Miracle chipboard die-cuts (Z1354). How about a Winter Layout? This layout uses the Resist technique. We stamped snowflakes from the Ice Crystals Stamp set (C1428) with versa mark ink. Then we used Clear Detail Embossing power and the Craft Heater to set. Once cooled, we used a sponge and rubbed ink around the snowflake. The ink sets to the paper and leaves the snowflake shiny white. The stars are from the Dimensional Element - Stars (Z1312). I applied some Sparkles from the Blue & Green (Z1327) collection and a few Opaque Pearls (Z1336) for glimmer & sparkle. For the title, we used the Irresistible Dots for "WINTER" and inked them with Pacifica ink. "FUN" is from the Posterboard Alphabet stamp set (E1014). Here is another favorite layout.... I LOVE these colors together. This layout is an interactive layout from Magic - One-Way Mirror. The colors are so bright and cheery. If you pull the scalloped piece at the top left page the photo will move and reveal hidden journaling. See next picture. When I slide this into my page protector, I will make adjustments to my page protector so that the photo will come up and the page is protected. These instructions can be found in the Magic book. CELEBRATE! That is what I did when I finished this next layout. We used the Party Pennants (C1429) for the flags. I cut out each flag and strung them along a piece of Colonial White Waxy flax. A tedious job but it looks great! The accents are from Mini Medley Accent Collections - Lagoon and Sunset. I also used the flowers from Foundry Flourishes. Here I am hard at work! Check back tomorrow and I'll wrap up the trip with some final thoughts and one very special layout. Our first full day of scrappin' fun began with the smell of bacon! We all know that for most of us (except for Kristine!) that it is very important to begin your day with a good breakfast. Our Chef, Marci must have known we had lots of layouts to get done so she started us off right. Check out this plate! Stuffed French toast, fresh fruit & bacon! The french toast had the most delicious mixture of cream cheese and pecans in between. Top it off with warm buttermilk dressing and you could just about believe you were eating breakfast in heaven! It was so hard not to go back for 2nds! I had gotten up early and gone for my daily walk before breakfast but after this meal - maybe I'd better taking up running! I know you all are anxious to see some layouts so I will add a few here now. This layout is called Happy Together. The word HAPPY was stamped on the buttercup cardstock using the Posterboard Alphabet (E1014) with Creme Brulee ink. We used the sunburst image from Ice Crystals (C1428) to randomly stamp the letters. We also used Buttercup cardstock to cover the Dimensional Element - Stars. The random circles were cut with a 1 1/4 inch circle punch (Z1311). Other colors of cardstock used: Pacifica and Bamboo. Embellishments - Colonial White Mini Medley Accents (Z1276) and Sunset Mini Medley Accents (Z1338). This layout is a mixture of embellishments of Mini Medleys, stickease and Color Ready Alphabet! It is also an interactive layout. The picture on the left page opens to reveal a picture on the back side and journaling underneath. (ok.... PRETEND there are pictures there!) The XOXO is stamped from the very popular Rustic Alphabet (E1002) - one of my most favorite E-stamps! The various stickease is from the Magnifique Level 2 Stickease (X7127C). "Hugs" and "Kisses" is stamped using the Friendship Alphabet Small (C1401). We used cocoa ink to color the word "affection" from the Color Ready Alphabet (X5750) This was a fun layout to do! Time for lunch! Lunch today was a Quesidilla Explosion Salad. Then it was back scrapping but I did take a break for my massage! Talk about relaxing! 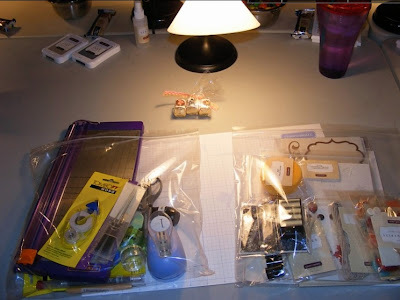 This layout used a mixture of paper from different packs (shows how well our paper packs can mixed and inter-mingled). 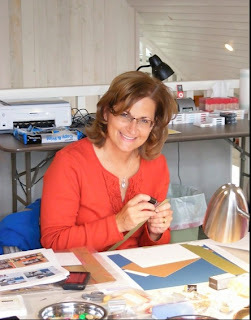 Have you been noticing pennants everywhere these days in scrapbooking? The flags on this layout are stamped using the new stamp from our Autumn/Winter Idea book called Party Pennants (C1429). Colors used: Tulip, Creme Brulee, Pacifica, Pear and Sunset. We also used Sunset and Tulip Mini Medley Accent Collections and the Sparkles - Blue and Green Assortment (Z1327). "PARTY" is stamped using the Posterboard Alphabet once again on Pacifica cardstock. FUN! FUN! After dinner which once again was DE-LICIOUS! Kristine led us in a game to test our knowlege of CTMH products. We found out some interesting facts! Did you know that Circle of Love (D1438) is the best selling stampset so far from the Autumn/Winter Idea book! It's a beautiful peacock stamp if you haven't seen it yet. The winning team each received an Old World Alphabet stamp (D1017). Lucky ladies! My team lost. :( I was the last one on my team to go. My question: Name as many paper packs that has a title with more than one word in 60 seconds. I had a "Minute to Win It" and only came up with FIVE! Ask me when I'm NOT under pressure and I would do a much better job! We had a lot of fun playing that game! I can think of one customer (and you know who you are!) that would have blown it out of the water. ha ha! Tomorrow I'll share more layouts and fun stuff! Stay tuned! I'm home! Am I refreshed? ha.... I'm exhausted actually..... but it is a good exhaustion from laughing and having a great time with 10 other ladies. The whole experience was AMAZING! Our hostess' for the weekend were Kristine Widtfeldt, VP Sales & Marketing and Monica Wihongi, VP Training, Events and Events for Close To My Heart. 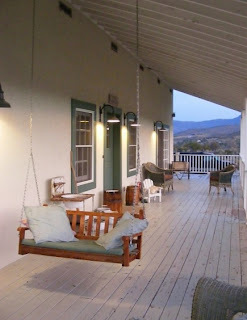 We arrived in Salt Lake City in the afternoon and a shuttle whisked us away to this beautiful scrapbooking retreat in Heber City, Utah. 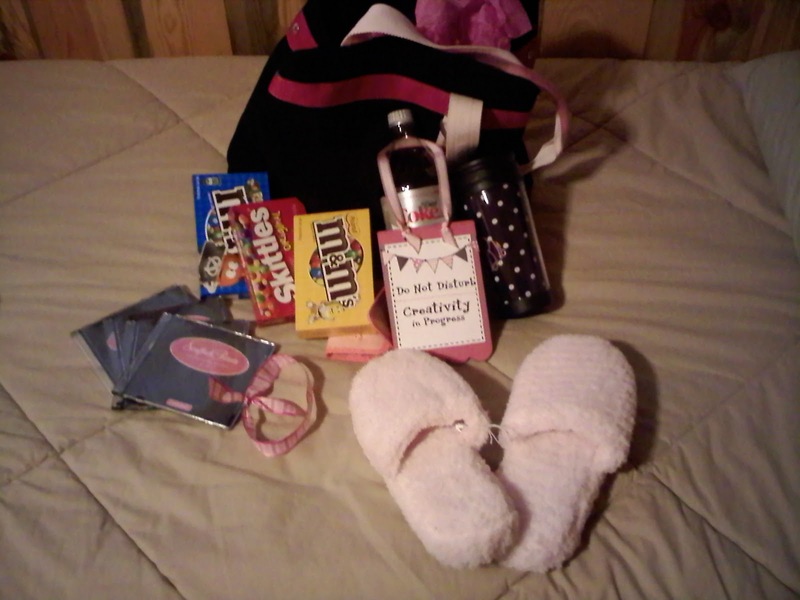 We settled into our rooms where we found these gift bags on each of our beds waiting for us! It's a tote that contained these fuzzy pink slippers (so cozy! ), my favorite snacks and a Diet Coke to wash them down, a monogramed coffee cup, 4 CD's of fun scrappin' music, a mani/pedi kit and an adorable door hanger! (see close up below) What a way to start the weekend! We also each got a new Faux Leather Album! After the game we proceeded upstairs to the scrappin' area where we began the first layout of the night. Now, I'd LOVE to show you pictures and tell you all about this first layout but it's a BIG SECRET that will have to wait until the new Spring/Summer Idea Book comes out! YEP! That's right! We got a sneak peak at the newest WOTG kit. YOU ARE GOING TO LOVE IT!!!! We completed 11 layouts and 4 clear cards this weekend. I won't show them all tonight.... I will save them to show over the next few days so you will have to keep checking back. One last thought for the night.... This was an AMAZING experience. 9 strangers from different parts of the US came together with one thing in common.... Close To My Heart. We left this morning with tears in our eyes because we bonded so much over such a short period of time. 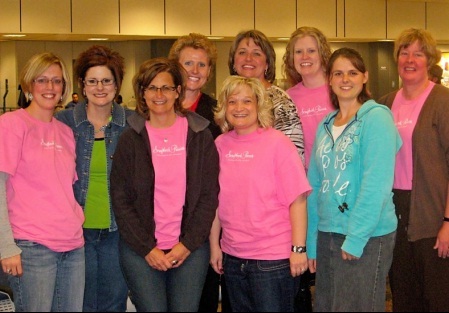 Kristine and Monica were so 'real' and each day I kept thinking how blessed I was to be a part of Close To My Heart. I will forever cherish these memories and these friendships that I have made this past weekend. Sorry I have no pictures to post as of yet. As of today, I'm probably all nestled in at a cozy cabin in the mountains of Utah! I'm actually typing this late Wednesday night. There is no internet at the cabin so all my exciting news and pictures will have to wait until I return! In case you haven't heard I'm off to my Scrapbooking Retreat that I won! (and if you didn't hear.... where were you when I was shouting the news all the way from the CTMH convention in Washington D.C.??) I won this back in July and at the time it seemed so far in future. But as the time has neared I've gotten so excited! I'll be scrapbooking with 8 other CTMH consultants. I have not met any of them yet but I'm sure we'll all be great friends by the time we leave. There is something about CTMH consultants.... I've never met a one that I didn't hit it off with! Must be the Bonding Memories Glue that 'bonds' us all together.... that and this wonderful company. 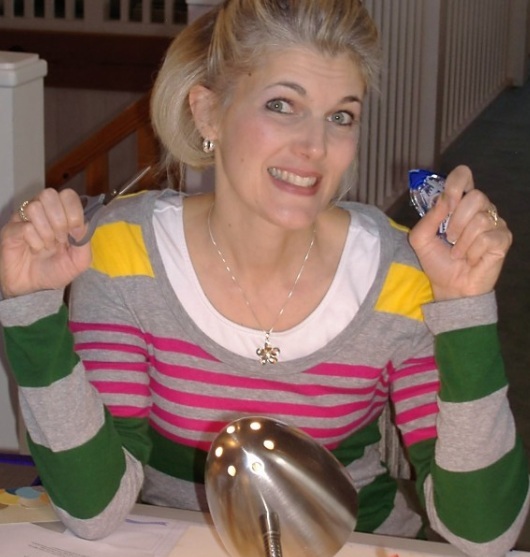 I got an email last week from Kristine Widtfeldt (She's the energetic blond you see alot in the CTMHTV videos). She said we will be creating 10 layouts PLUS a cover page. She sent a list detailing picture sizes used, suggested theme of pictures and the colors that will used in the pages. I was so overwhelmed at trying to figure out WHAT pictures to bring that I pretty much decided I won't take pictures. I'll wait and add them when I get home. I just hope I'm not disappointed that I'm waiting. Also, Kristine said that we'll be doing a "High end" Magic layout! Sounds like we'll be using lots of embellishments! And the best thing....... I don't have to pack a paper trimer, adhesive, scissors or ANY OTHER scrapbooking tool!! They will have everything we need. That is so AWESOME! Oh and food!!! It's not a complete retreat if you don't stuff yourself on great food! Kristine sent a sample of the menu we'll be having. All I can say is - so much for my diet. :( but I'll try to take my mom's advise and only eat 1/2 of everything. Be sure to check back on Monday! I'll be posting pictures and sharing my Utah Scrapbooking experience! Close To My Heart's October Stamp of the Month adorable! The stamp - Share the Magic has 12 stamps! I just love the little light bulb stamp. I used Cranberry and New England Ivy markers to give the bulbs their Christmas Color. For the Santa and his bag, I used the masking technqiue with B&T paper from the My Reflections Mistletoe paper. For the fur and Santa's beard I used the Fun Flock for added dimension. On this circle card I used the tree image and then 'trimmed' it with sparkles from the Red, Pink & Purple Sparkle Assortment (Z1326). The tinsel is gold embossed. These circle cards can be purchased in White (Z1353) or Colonial White (Z1352) and come with 12 cards and 12 envelopes. This clear card was fun to create! This snowman is covered in Prisma Glitter to make him glisten in the snow! His scarf is from B&T paper from Magnifique (again using the masking technique). The inside of the card is covered with Pacifica cardstock and stamped with snowflakes. I dotted each snowflake in the center with Glitz Glitter Gel and closed the card before it was dry. The glitter gel then attached itself to the underside of the card front! I loved the way this turned out! The Clear Card is item #1309. You get 4 square and 4 scalloped cards including clear cello envelopes. Here is one more use for this stampset - Gift Tags! I stamped the images and colored them in with our watercolor pencils and then used a blending pen to smooth out the colors. The images are fun and easy to color and would make a great activity for kids! Do you like this stamp? It is ONLY available during the month of October. Check out my website for details on how you can this stamp at a discount or even FREE!